US Top Fuel Dragster racer Doug Herbert comes from a famous drag racing family: his father Chet contested the first drag race at Santa Ana before founding Herbert Cams and promoting his products with huge sucess on the race track, and aunt Doris Herbert ran the legendary newpaper Drag News. Doug grew up with drag racing, often finding himself rubbing shoulders in the pits with such names as Don Garlits, Don Prudhomme and Tom McEwen. Doug started his business Doug Herbert Performance Parts in 1986 and started racing in the same year in an alcohol dragster. He stepped up to Top Fuel Dragster in 1991, and secured backing from sponsor Snap-On Tools in 1992, a deal which continues to this day and is one of the longest-standing sponsorships in the sport. Doug won four IHRA World Championships before running exclusively with the NHRA, finishes in the top ten in the NHRA Powerade Top Fuel Dragster Championship every year, and was the second Top Fuel Dragster racer to record a terminal speed over 300 mph. Eurodragster.com spoke to Doug by phone in January 2006 shortly after he arrived in the UK for a week of Motorsport Industry Association visits. We are grateful to Doug for his time, especially since he had hardly slept on the overnight flight due to severe turbulence. We are also grateful to Jeff and Belinda Bull for their help in organising this interview at short notice. We started by asking Doug about the condition of Crew Chief Wayne Dupuy, who had been involved in a serious car accident in December 2005. 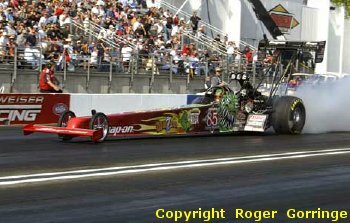 Eurodragster.com: How is Wayne doing? Doug Herbert: Wayne came out of hospital on Friday and went straight to my race shop! He can do about two or three hours and then he gets tired, but his home is only about a mile away so he goes home and rests and then comes back. By the time the Winternationals come around he'll be pretty good, about 95%. He won't be able to do as much physical work as he would but it will be good to have him there. The first time I saw him after the accident he was bad, he got beat up pretty good, but he's tough. Eurodragster.com: Jim Brissette is standing in for Wayne, but you have worked a lot with him anyway haven't you? Doug Herbert: That's right, Jim has been with me for years. He was my Crew Chief when I raced in IHRA and also when I was the second racer over 300 mph. Jim and Wayne compliment each other: Jim's experience helps Wayne, and that's a big reason that the car runs so good. Eurodragster.com: One of our readers (Andy Marrs - Ed) has asked us if we would ask you whether you can feel the difference between a 4.4 and a 4.8, or whether it all feels the same after a certain point? Doug Herbert: I can usually get out of the car and tell to within a couple of hundredths what I've run. When I ran a 4.4 I could tell, because at about four or five hundred feet it pulled up the front end and really took off. You can tell a tenth's difference, and a 4.65 and a 4.50 are like night and day. Eurodragster.com: You have been with Snap-On Tools forever. Is there something in particular you are doing right which keeps them on board? Doug Herbert: I've been with Snap-On Tools for fifteen years. My theory is that I give them more than they expect. Force, Bernstein and I all do the same. The sponsor gets a good deal. A lot of people think that putting the name on the car and running the car is all they have to do. But the companies care about exposure and generating good deals for their customers. So all the stuff I can control - appearances etc - I do as well as I can. The race car I can't control. Anyway, it's not always the most important thing how the car runs. You have to make sure that the sponsor knows what you do, and I send them an update every month. Eurodragster.com: Could you put an amount on the time you spend on promotion? Doug Herbert: Some weeks I'll spend several days doing stuff for Snap-On. I visit dealers and I ride tool trucks. And next week I am going to Vegas. Eurodragster.com: You also have a programme to support the US Marines, how did that come about? Doug Herbert: We got to be friends with Major Philip Toretti via Rob Geiger of NHRA. Rob told us that he had a Marine he wanted to bring to a race. We said "Bring him to us" and he had a great time. I told Major Toretti that if there was anything we could do to help then we would, and he asked if we could do the same for other Marines and we said yes. These kids are so young, they're eighteen and nineteen years old and they've been at war for a year and have gotten a dose of reality real quick. It sure makes their day to spend time with us and it makes us feel good to do it. Eurodragster.com: Back to the racing, and what do you think about multiple-car teams? Is it something you would do? Doug Herbert: We ran two cars for a couple of years, with Jim Bailey and then Paul Romine. We wanted to run two identical cars to get more data. We couldn't get enough funding to continue to run two cars, though. I think two-car teams are a good thing and if the opportunity came up I would do it again. I like to work on cars and watch them run, too - I'm addicted to racing! Eurodragster.com: Does your Performance Parts company have a lot of customers in Europe? Doug Herbert: Some of my best customers are here. Jeff Bull, Kenny Coleman and Clive Bond spring to mind. They've been customers for years. You firstly develop business relationships and then you become friends, and I'm good friends with all these guys. You have to get your priorities right. Jeff, Kenny and Clive have all been to races with me. Eurodragster.com: You seem to be one of the Suppliers of Choice for European racers wanting to buy a Top Fuel operation. Is it just because we've got some big guys over here and you're a big guy so they'll fit in your car, or do you enjoy a reputation for giving a good deal? Doug Herbert: It's good to have a good reputation! I do try to give them a good deal. The Swedish guys did well with one of my cars this year (Lorentzon and Möller - Ed) and another team are buying a complete car from us. And your Alcohol Funny Car Champion Urs went good yesterday. That started when I got an E-Mail asking if we were interested in selling a car. I said "What do you need?" and they said "Our driver is big like you!". We had the team over for the weekend and showed them everything, and yesterday Urs made three runs and went to 330 feet I think. The first hit of the throttle shocked him a bit, but we'll keep helping him and his team to make it as easy as it can be. He is going to do good in that car. Eurodragster.com: What impression do you have of drag racing in Europe? Doug Herbert: To me it seems like the sport is growing as much as it is in the US. The cost must make it difficult. I watch the European guys' results, the numbers aren't the same but then the track conditions aren't the same. It's the best guy on the day who wins. Eurodragster.com: So what's in your schedule this week? Doug Herbert: ...well, we can learn from them. We are also visiting Pye Industries and Cosworth, and we are also going to Birmingham, and lots of other stuff I can't remember. We're booked up minute-by-minute but it should be fun. Eurodragster.com: We hope you have a great few days in the UK, Doug. Thanks very much for your time, good luck for the 2006 season and please give Wayne our best.